Mira Mesa is a well-connected community of residents who care about everything from The City of San Diego’s Pure Water Program to making sure each year young people have an array of spring and summer activities to keep them busy! With a population of more than 71,000 people, Mira Mesa feels more like a small town than the suburb of a large city. Read on to learn why you should move to this little slice of heaven in Southern California. Once home to a United States Naval airfield called Hourglass Field, Mira Mesa is bound by Interstate 15 on the east and the 805 on the west. During WWII Hourglass Field was a 10,000 square-foot bomb testing area for the US Army, which then transformed in 1969 to housing tracts. Today, Mira Mesa is directly north of Marine Corps Air Station Miramar (MCAS) and has been called home to military families for decades! MCAS even hosted the Navy’s Top Gun School for 30 years. 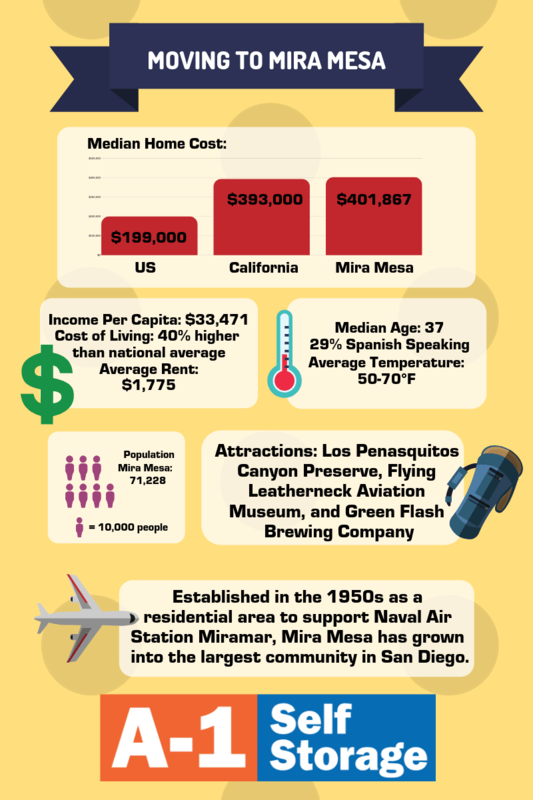 It wasn’t only the military who discovered that Mira Mesa was a desirable place to live. Employees at telecommunication technology companies like Qualcomm, biotech and pharmaceutical industry leaders, and faculty and staff members of The University of California- San Diego have made Mira Mesa their home. By 1971, local politicians were running election campaigns on slowing down the speed of growth for the area. Some thought growing too large too fast was detrimental to the area’s infrastructure. The effort to keep Mira Mesa small didn’t last long! Today, this community is considered one of the largest in San Diego. The average income per capita is $33,471, 12% higher than the national average. Due to high housing process, you may want to rent with roommates or lease on your own before hopping on the property ladder. Median home purchase prices are $401,867 in Mira Mesa. To set yourself up for an easier first year financially in Mira Mesa, you might consider the option of dividing the average rent of $1775 per month between multiple roommates. Families with small children will consider a move here an investment into their children’s education. Student-teacher ratios are 26% higher than the rest of the country! This means kids in Mira Mesa, California are getting more individualized attention. It’s not difficult to see why children in this area have higher test scores and graduation rates on average than their peers in other cities. With five elementary schools, two middle schools, and one high school, this community meets the needs of its youngest population. Hop a ride on a bus or trolley and get anywhere in San Diego! Transportation services have never been more accessible. Pick an app of your choice and before you know it a car will be waiting! Be sure to double check license plates to verify you are actually getting into the car you ordered. Remember, Mira Mesa is just a train stop away from some of the best sights and sounds the California Coast has to offer! Happy Sushi has some of the best rolls and fresh fish in the area! Is it Thai food you are craving? Try Siam Nara Thai Cuisine Restaurant located on Mira Mesa Blvd. The food here will spice up your life! Owner and Executive Chef Nok’s entrepreneurial story will touch your heart. She has been cooking since age 7 with her Mom, and now owns another successful restaurant in Hillcrest called Amarin. If you experience a rare, chilly day in San Diego try Pho Ca Dao. Their large portions of Vietnamese soup will fill you right up! There’s plenty of variety when it comes to getting your grub on in Mira Mesa. Mexican, Italian, fresh seafood, and Indian food will make it hard to decide where to eat first! If playing outside for the day is more of what you have in mind, check out La Jolla Cove, Mt. Soledad National Veteran’s Memorial, or the famed San Diego Zoo. There are numerous outdoor adventures to choose from due to the mild temperatures and beautiful coastline of San Diego! Are You Ready to Move to Mira Mesa? What if you could relocate without any hassles or problems? Our goal at A-1 Self Storage in Mira Mesa is to make sure stress-free is your reality. This town is an ideal place to put down roots, but we know a move can be time-consuming and overwhelming. Let the team at A-1 Self Storage simplify this life event for you! Our trained storage professionals are ready and waiting to assist you! Come in and see us, call, or email us today!